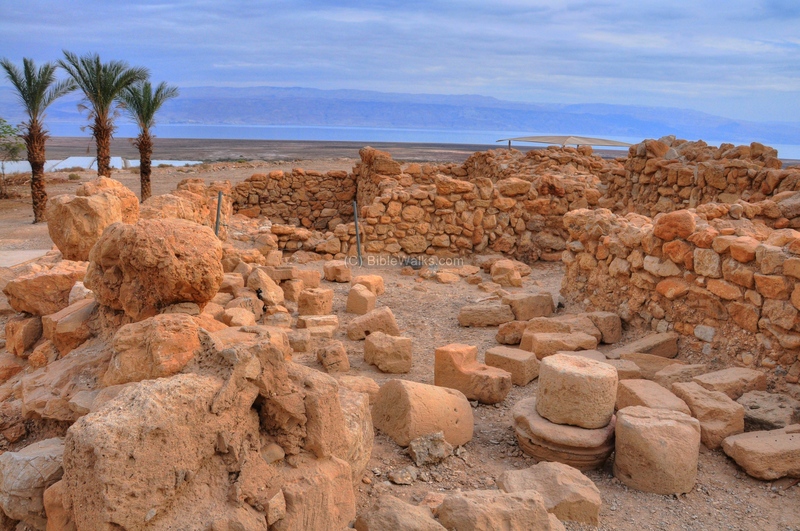 Ruins of a famous Roman period settlement on the north-western shore of the Dead Sea. This was the home of the Essenes, a break-away sect. 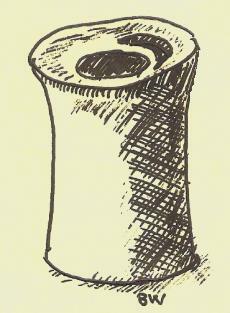 Scrolls, hidden in jars, were discovered in the caves around the site. Wars 2 8:" These Essens... and as for their piety towards God, it is very extraordinary..."
Ruins of a famous Roman period settlement on the north-western shore of the Dead Sea, home of the Essenes, a break-away sect. 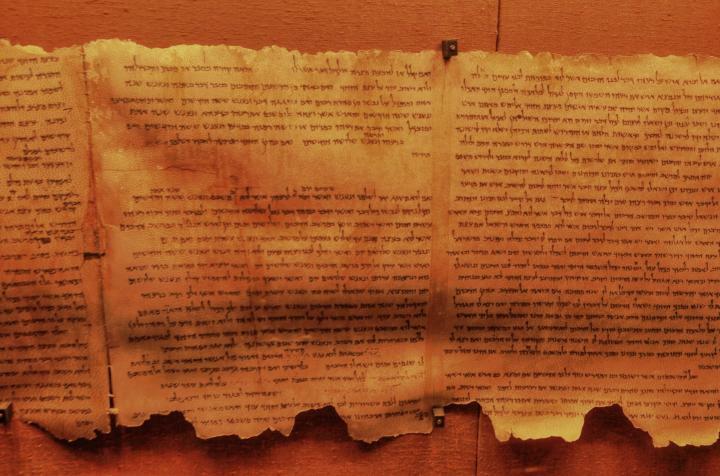 Scrolls, hidden in jars, were discovered in the caves around the site, and are an important contribution to Biblical and historical research and are regarded as one of Israel's most precious national treasures. 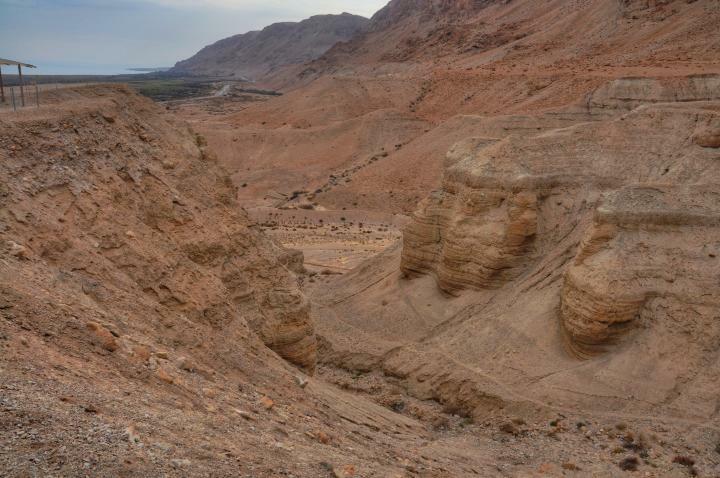 Qumran is located 70M above the level of the Dead Sea, which is about 1KM to the east. The site is 325m under the sea level. The hills of the Judean desert are located on its western side. The aerial map of the area is shown below, indicating the major sites. You can point on the purple points to navigate to the selected site. 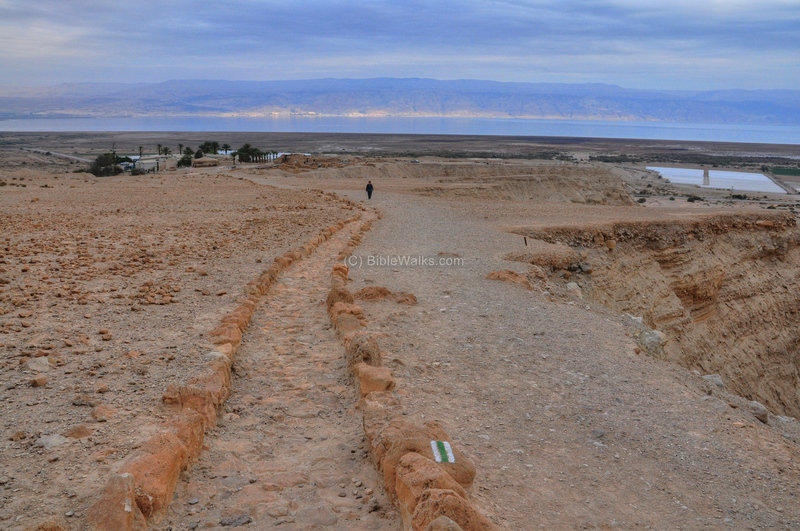 The site was built on a raised marlstone (Havar) hill above the Dead Sea. 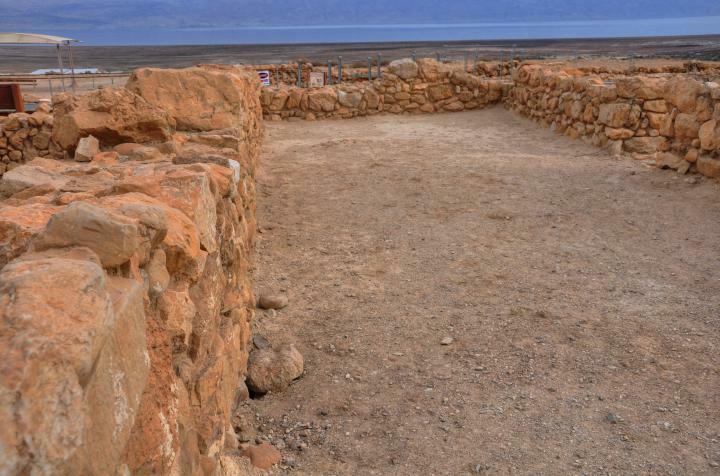 It is located on the path of ancient routes - a strategic mountain pass westwards to Hebron via the Qumran brook, and the southern coastal road along the Dead Sea. 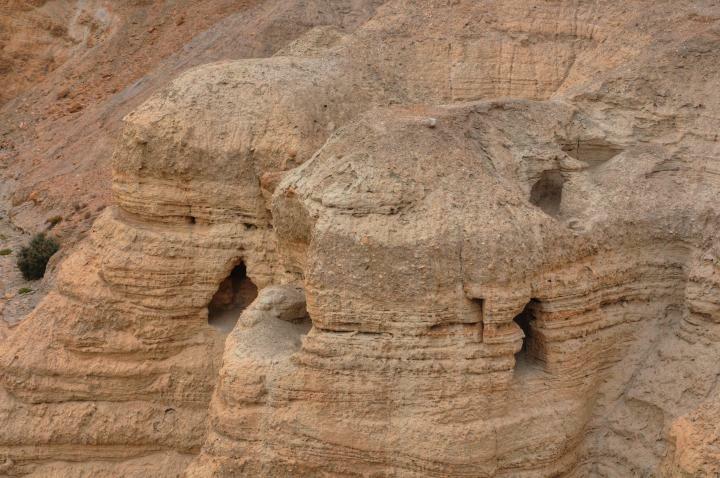 Qumran was established during the Iron age, 7th/8th C BC, at the times of the Judean Kingdom. This fortress may have been one of King Uziah's construction projects which the Bible reports (2 Chronicles 26 10): "Moreover Uzziah built towers in Jerusalem at the corner gate, and at the valley gate, and at the turning of the wall, and fortified them. Also he built towers in the desert, and digged many wells". An ancient round water cistern was left from that period on the western side of the ruins of Qumran, and later incorporated into the Hellenistic period settlement. A rectangular fortress was built on the eastern side of the cistern, but was removed during the construction of the settlement 400 years later. 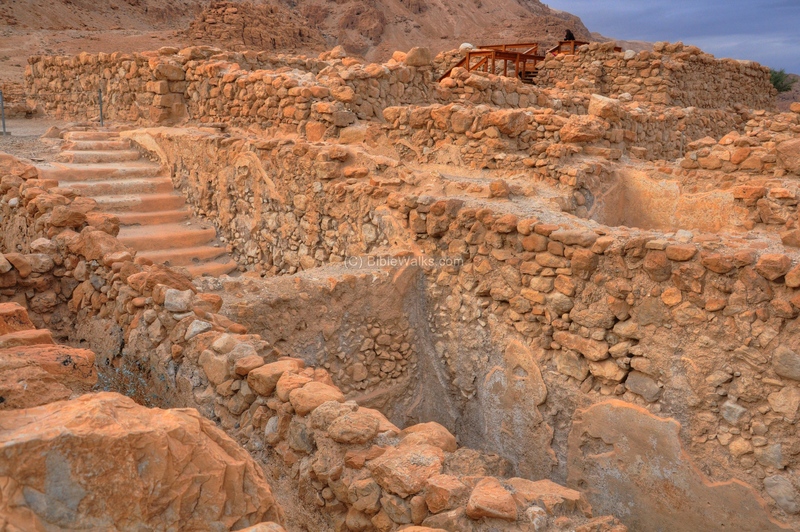 Qumran may have been one of the desert cities listed in the Bible as part of the Judah tribe villages . Its name was either "Secacah" or "city of salt". 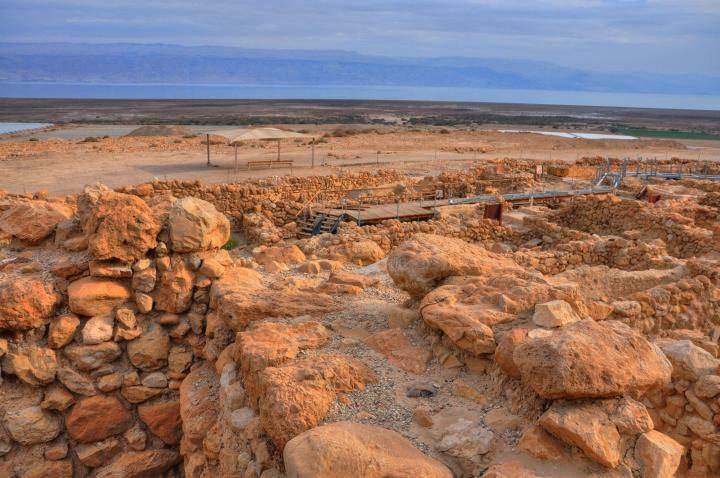 Joshua 15 61-62: "In the wilderness, Betharabah, Middin, and Secacah, And Nibshan, and the city of Salt, and Engedi; six cities with their villages". During the end of the 2nd C BC the site was resettled during the times of the Hasmonean kings - John Hyrcanus I or Alexander Jannaeus. 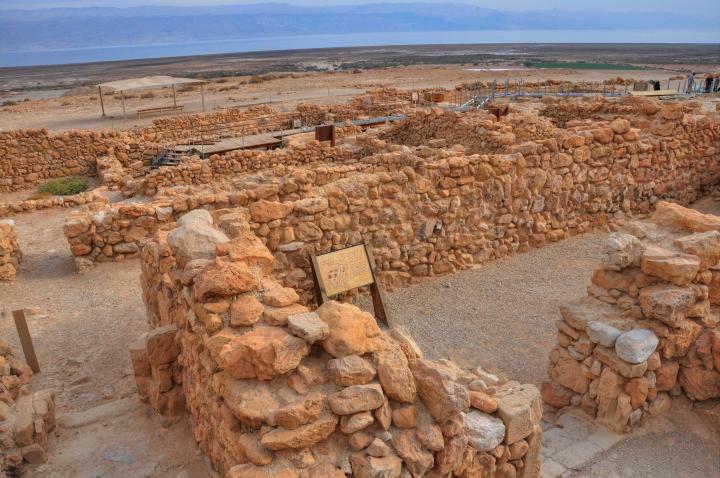 The new settlers were a break-away sect known as the Essenes (or Essences), who populated the caves and oasis sites along the western shore of the Dead Sea. They preferred to live in a remote area, far from the normal life in the cities and villages of Israel. 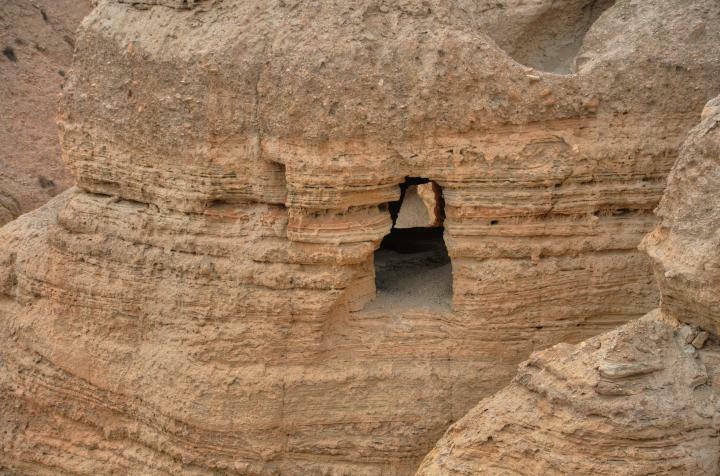 Qumran was a regional center, since most of them resided in caves and tents. It was built as a self supporting communal village, functioning as a a sort of Monastery (which is one of the oldest known). Josephus Flavius describes this sect, one of the main "three philosophical sects among the Jews", with a very detailed description. Excerpts from his book (Wars 2 Chapter 8) include: "...the third sect, which pretends to a severer discipline...these men are despisers of riches, and so very communicative as raises our admiration... And as for their piety towards God, it is very extraordinary...". Josephus also added that the Essenes were subdivided between themselves, each with slightly different practices. During the Great revolt against the Romans, the sect sided with the rebels. John the Essene was a local hero and general in the rebel army, and a messenger on behalf of the government to recruit other cities to the Jewish forces (Wars 2 20 4): "John, the Esscue, to the toparchy of Thamna; Lydda ... and Joppa, and Emmaus". He was killed in the military campaign near Ashqelon (Ascalon), as per Josephus (Wars 3 2 1-2): "This excursion was led on by three men, who were the chief of them all, both for strength and sagacity; Niger, called the Persite, Silas of Babylon, and besides them John the Essene". 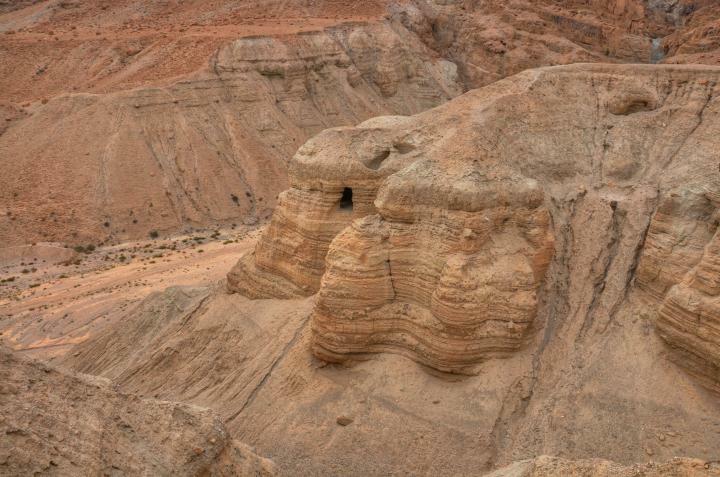 The residents of Qumran prepared themselves to the worst, and hid their precious treasures (the scrolls) in the caves. 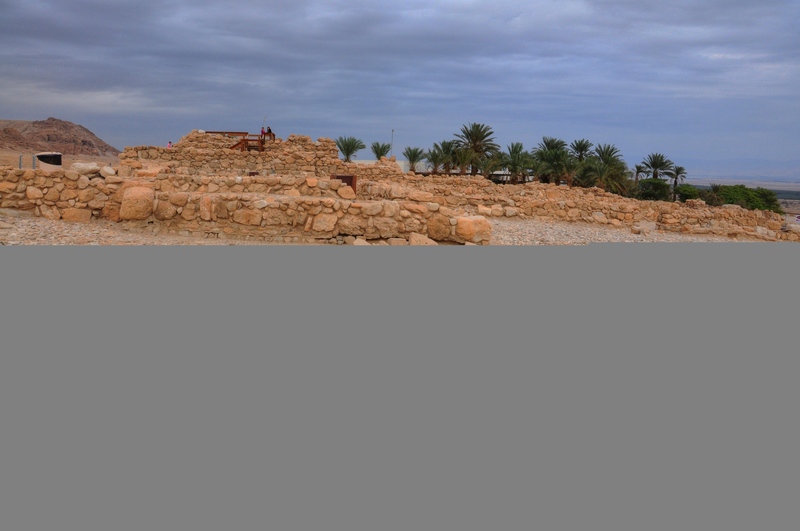 The Romans indeed conquered Qumran (68AD), destroyed it and dispersed the sect. According to Josephus, the Dead Sea ("lake Asphaltitis") was full of bodies from the Jordan valley cities and villages, killed by the Roman troops which were commanded by Placidus (Wars 4 7 6): "And now Placidus, after this good success that he had, fell violently upon the neighboring smaller cities and villages; when he took Abila, and Julias, and Bezemoth, and all those that lay as far as the lake Asphaltitis, and put such of the deserters into each of them as he thought proper. He then put his soldiers on board the ships, and slew such as had fled to the lake...". Years later, during the Bar-Kochba revolt (132-135AD) a Roman Garrison was stationed here to control the regional traffic. They left after 20 years, and Qumran was abandoned and left in ruins for 1800 years. 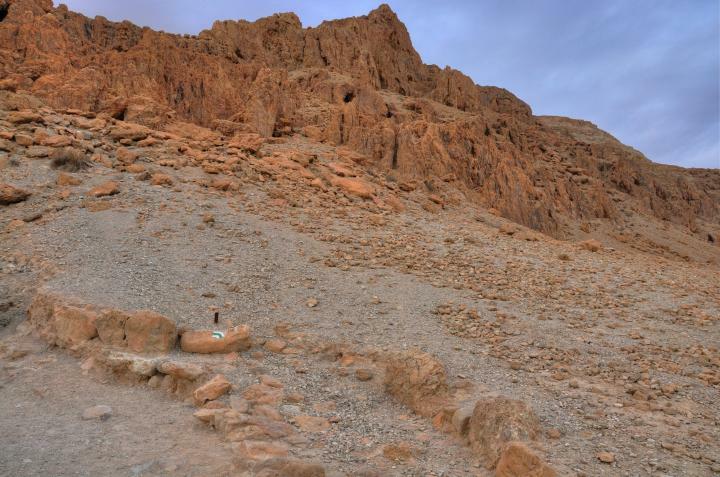 In 1947 Bedouins shepherds discovered ancient scrolls in a local cave 1.5KM to the north of Qumran ("cave #1"). 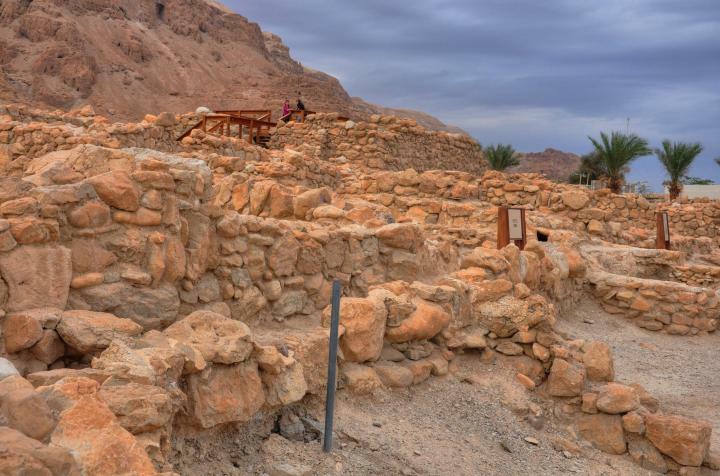 The area was excavated and additional scrolls and fragments were discovered in 11 caves around Qumran. 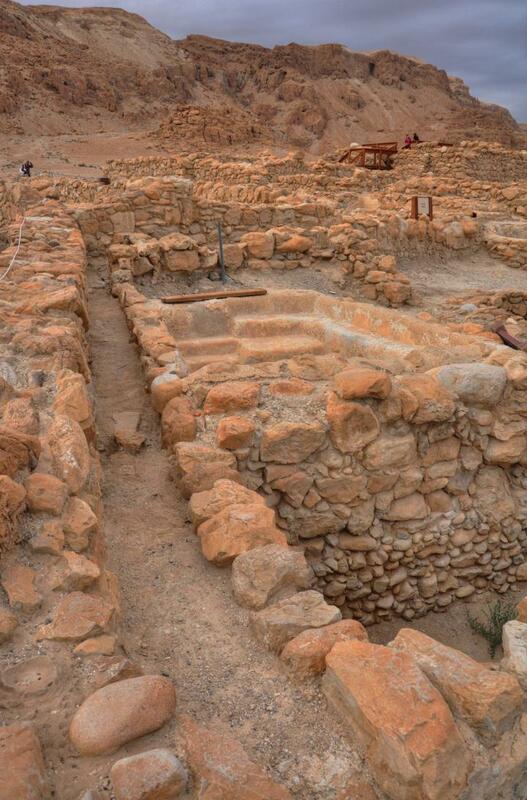 The scrolls were hidden in jars, and were preserved relatively well due to the dry climate of the Judean desert. 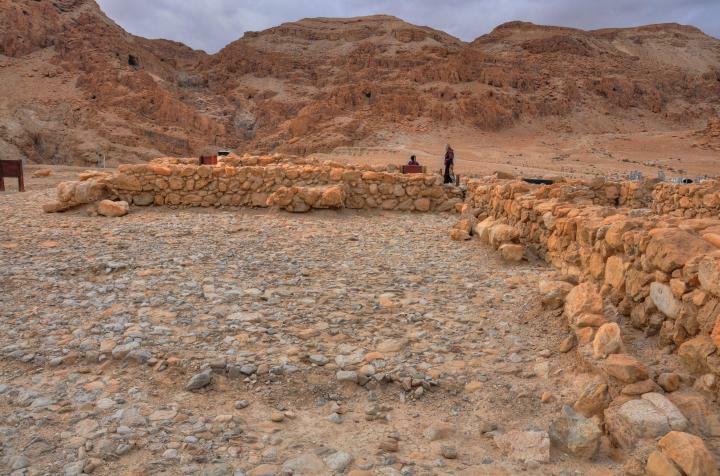 From the distribution of the location of the scrolls the archaeologists determined that Qumran was the nucleus of Essenes activity in the region, a sort of learning center for the sect. The buildings in Qumran included mainly public structures that hosted large public events, workshops and a scriptorium where the scrolls were written. Most of the residences were probably in tents around the center. 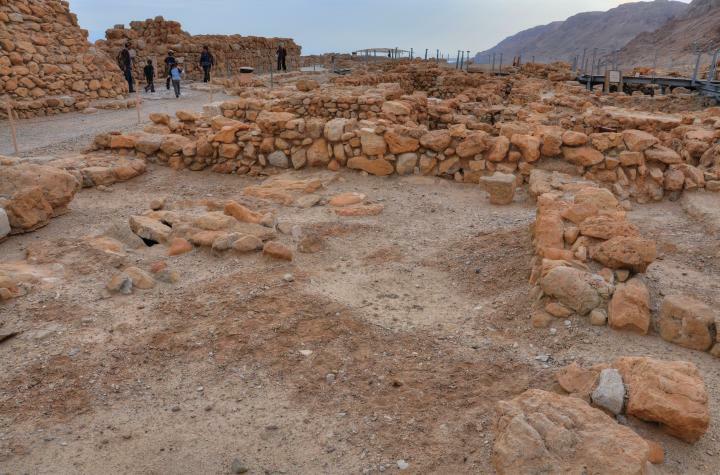 A large cemetery of a thousand tombs were located near the ruins of Qumran, which further indicated that Qumran was a center for the Essenes sect. The site is a major national park and is highly recommended. Recently (2009-2010) it undergoes renovations, with newly installed walkways. 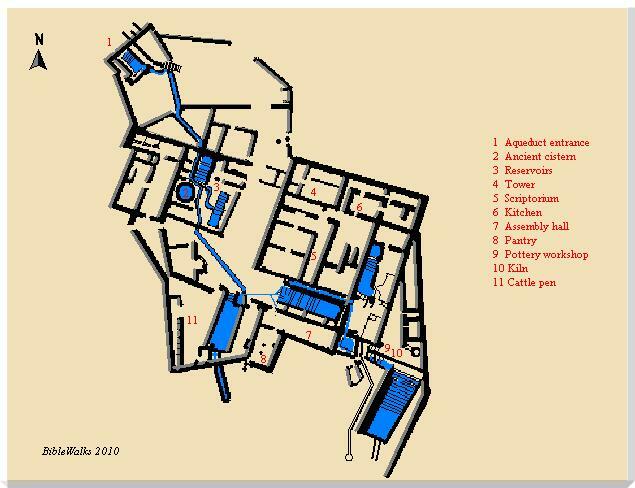 The plan of the reconstructed Qumran is shown in the following diagram, showing the design of the rooms and structures (in grey and black), and the water supply system (in blue). The major points of interest are numbered and their description appears on the legend at the right. You can click on each of the numbers to navigate to that location. The photos below show the highlights of the ruins of Qumran. The location of the major points of interest are pointed out on a small scale version of the plan of the settlement. The order is mostly clockwise, starting from the north - where the entrance is located. A small square tower is located on the north side of the settlement, near the entrance from the visitors center. The diagram on the right shows the location of the tower as a red square. A view of the tower from the west side is shown in the picture below. 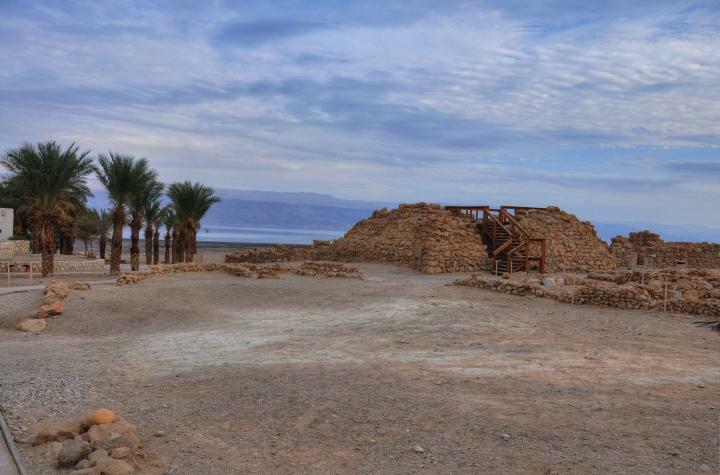 Behind the tower is the north side of the Dead sea. Beyond the great salt lake is the mountains of Jordan. A closer view of the tower area and the north side of the settlement is in the picture underneath. The folowing picture shows a closer view - from the north side of the tower. From the top of the tower is a great view of the ruins. The picture below shows the north-eastern side of Qumran, with the Dead sea in the background, and the mountains of Jordan behind it. This section, adjacent to the tower, had residential rooms and a kitchen. They are indicated by a red square on the diagram at the right. A closer view of the kitchen and residential rooms is shown below. This was the scribes' room, where the Essenes wrote their scrolls. The room is located in the center of the settlement, on the southern side of the tower, as indicated by a red square on the right diagram. The scribes wrote on papyrus, leather and copper Biblical books, Apocrypha (external books) and the sect's own books. The entrance to the room is seen in the picture below, and the long room extends to the right. Behind the wall is a courtyard, and behind it is a series of pools. The photo below shows the scribes' long room. According to the reconstruction, it was a 2 story room. In this long room there were traces of tables and benches made of plastered mud bricks. The interesting findings were ceramic and metal inkwells that led the archaeologists to the conclusion that this was the scriptorium. The scrolls that were prepared here were hidden in the caves during the great revolt against the Romans (68 AD), and waited almost 2,000 years to be rediscovered. 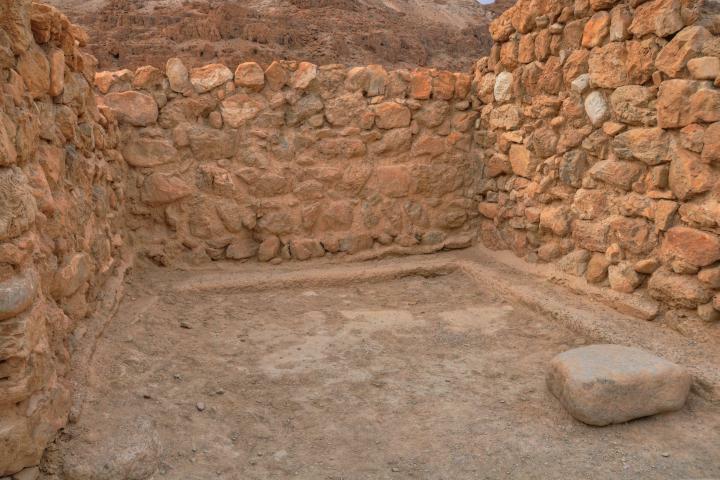 The following photo shows the room on the other side of the wall of the scribe's room. Hundreds of pottery lamps were found in the room, which were used by the community for reading at night. According to the Essenes scroll (Community rule VI, 7-8): "The congregation shall watch in community for a third of every night of the year, to read the book and to study law and to bless together". The next picture features a ritual bathhouse - Mikveh or baptismal. The Essenes were ascetics - a lifestyle characterized by abstinence from various sorts of worldly pleasures. They paid great attention to purity and ritual bathing. The ritual baths were constructed according to the Jewish religious laws: the structure was built in the rock and not above it, to be in direct contact with the ground. The water should flow, undrawn, into the pool. The amount of water must be at least 1 cubic meter, 1.2M high, and the walls must be plastered. There are two sets of separated stairs: one side was for the way down to be purified, while the other side for the cleaned bathers. 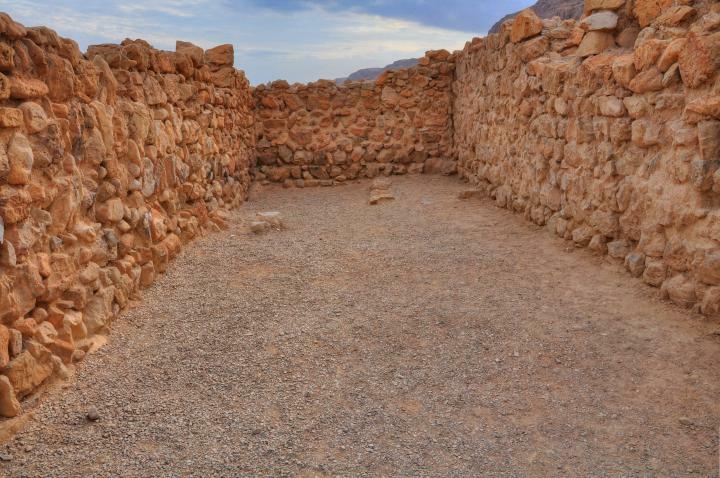 Members of the sect assembled in this room, which is located on the southern side of Qumran (marked by a red square on the diagram). A raised platform on the western side was probably the stage used by the head of the commune for speeches. In the adjacent room (the pantry) on the south-western side, hundreds of tableware pieces were found. This indicated that the large hall, seen in the picture below, was the central dinning room, in which ceremonial meals were eaten and deliberations were conducted. According to the Essenes Community rule scroll ( VI, 2-5): "They shall eat in common and bless in common... and when the table has been prepared for eating and the grape juice for drinking the priest shall be the first to stretch out his hand to bless the first piece of bread [or grape juice]". Josephus wrote about the dining room (Wars 2 8 5): "... they go, after a pure manner, into the dining-room, as into a certain holy temple, and quietly set themselves down; upon which the baker lays them loaves in order; the cook also brings a single plate of one sort of food, and sets it before every one of them; but a priest says grace before meat". 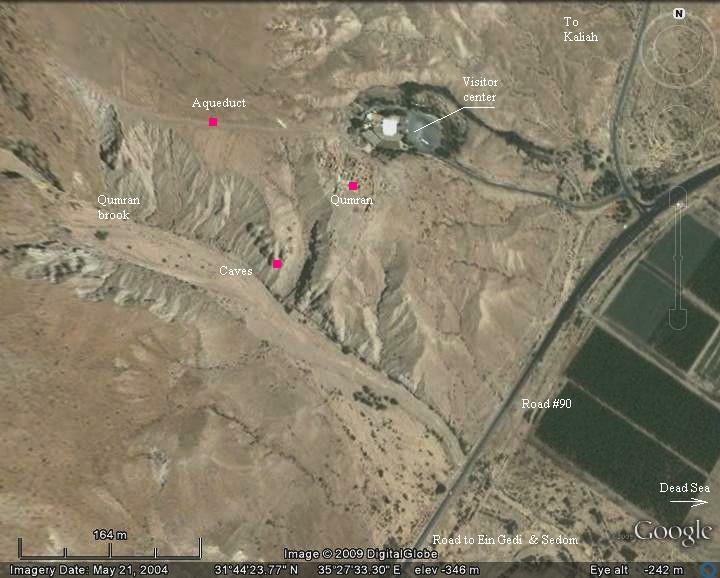 On the south-eastern side of Qumran (indicated by a red square on the right) are the ruins of the pottery workshop, and its kiln (on the east side). Several rooms were used for the process of manufacturing the ceramics - including tools, kitchenware, tableware and storage jars for the scrolls. The picture below shows some of the rooms in this section, and pools that are located on the other side of the wall. 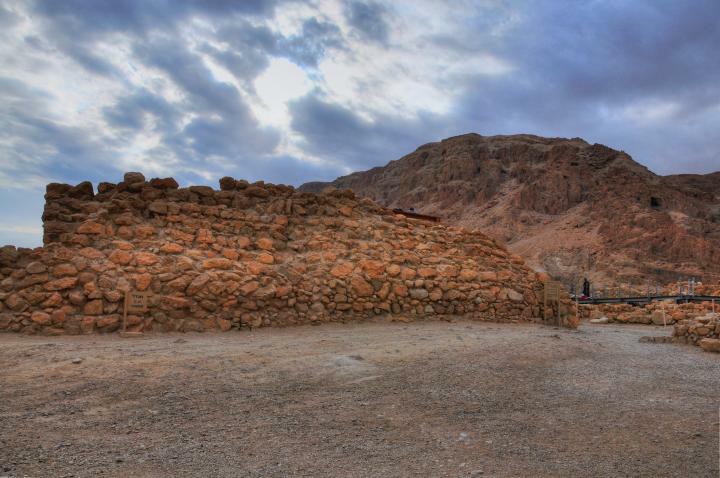 On the southern side of Qumran, outside of the walls, is a large paved work area. This area is indicated by the red square on the diagram. 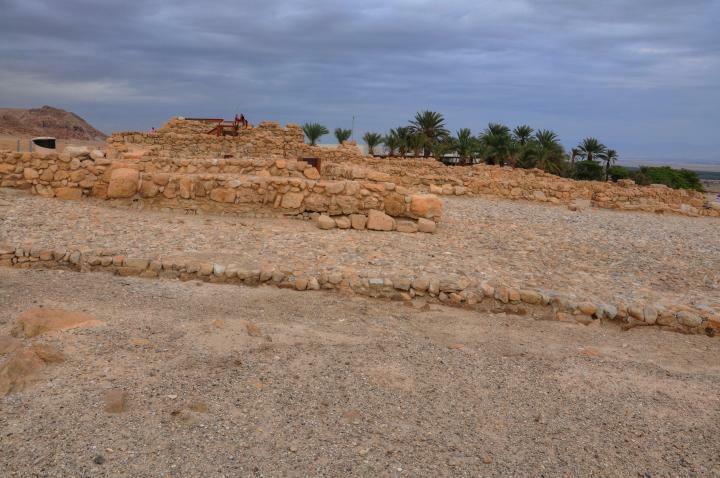 The excavators discovered here 100,000 date pits and an installation for producing honey from the dates. This was one of the main sources of income for the congregation. Another view of the work area and the southern side of the settlement is shown in the next photo. The tower stands out in the back of the ruins. 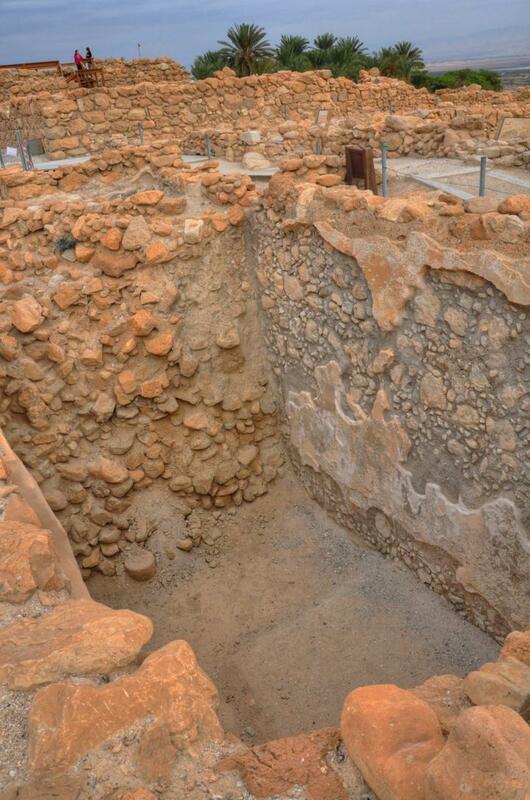 This section, on the western side of Qumran, is located around an ancient, round cistern. It is marked by a red square on the diagram. The cistern was built in the 7th-8thC BC, during the Iron age, perhaps by King Uziah as part of the construction of towers and wells in the desert (reported in 2 Chronicles 26, 10). Later, during the Roman period, several cisterns, baths and ritual baths were added around the round cistern. They all were fed water by the aqueduct. The photo below shows a water channel that conveyed water from the aqueduct to the cistern on the left and the ritual bath on the right. 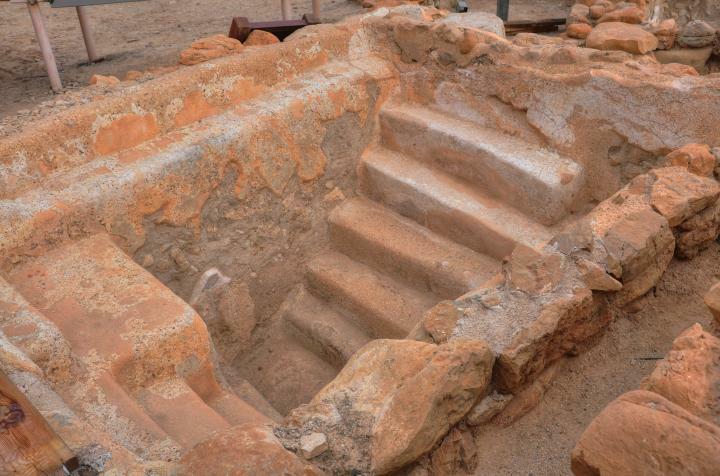 A closer view of the ritual bath is seen on the next picture. Josephus writes about the ritual bathing: "...and when they have clothed themselves in white veils, they then bathe their bodies in cold water". The photo below shows a large cistern. 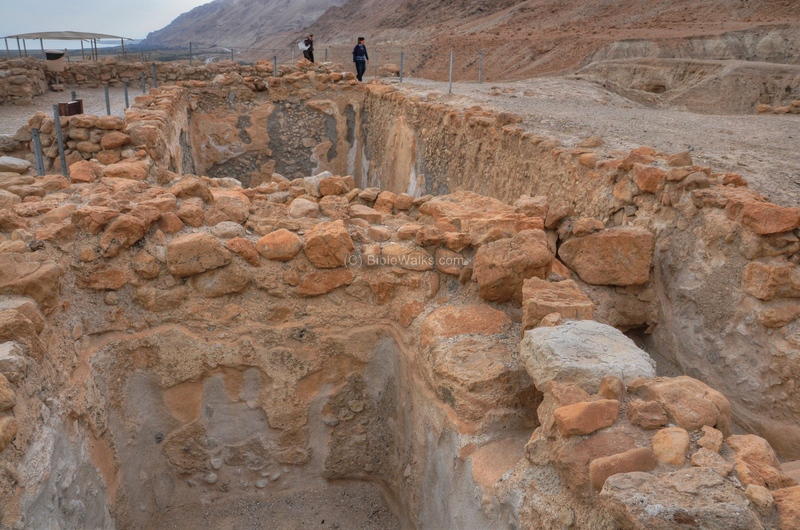 There are 10 cisterns in Qumran in different sizes, all connected by channels to the inlet of the aqueduct. Their walls are covered by several layers of thick plaster. Yet another view of the cistern is in the next photo. On the right side of the long pool was a cattle pen. 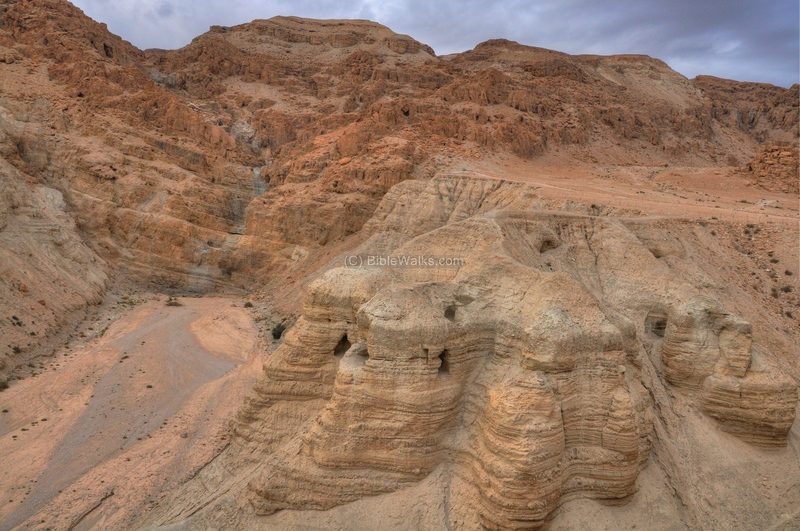 Qumran is located on a raised marlstone (Havar) hill above the Dead Sea. The southern side of the ruins is a deep gorge that cuts through the stone. 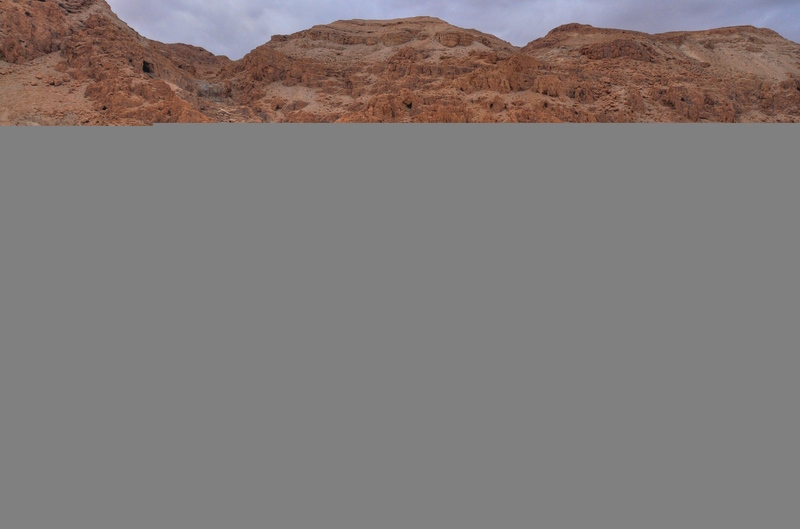 Inside the hill are several of the famous caves of Qumran, where the ancient scrolls were found. 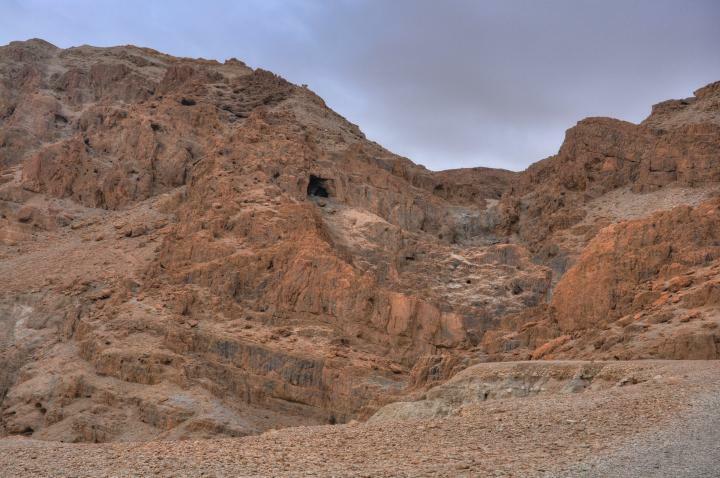 In this cave (cave #4) and 10 other in the area around Qumran, 15,000 fragments of scrolls were found during 1947-1956. They were later pieced together to produce 530 different scrolls, with about 200 books from the Old Testament. This restoration work was finally completed and published in 2001, and also published online in 2011. 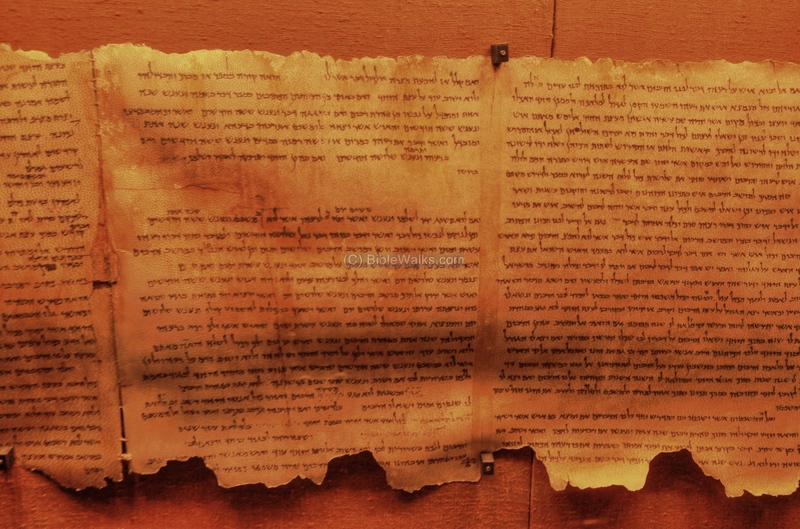 The Dead Sea scrolls are one of the most important archeological findings and an amazing discovery that shed light on the early Roman period and the Biblical research. The scrolls were hidden in jars by the Essenes, probably to hide them from the approaching Roman troops during the great revolt (68AD). However, they were torn to pieces in ancient times - perhaps by a Roman soldier - and were further damaged by animals and effects of climate over the long period that passed since then. 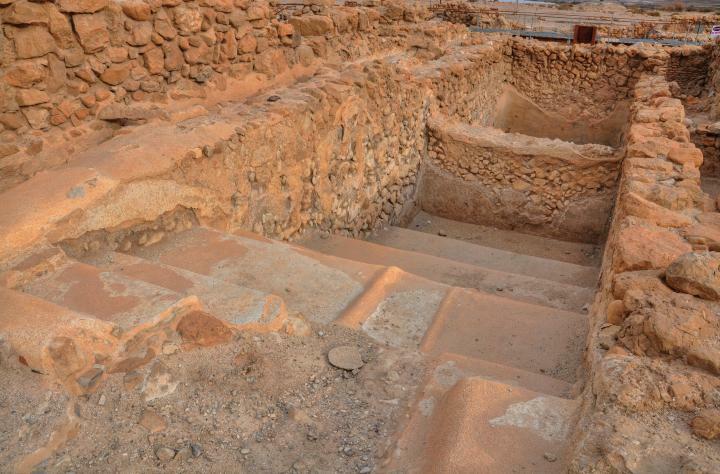 The ancient elaborate water system kept the settlement it alive in the dry climate of the Judean desert. 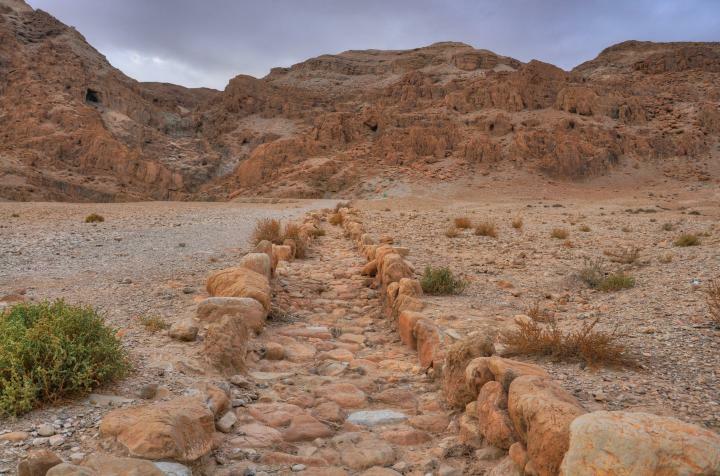 An aqueduct, several hundred meters long, supplied the water from a dam in the course of the Qumran brook, and filled up its cisterns through an elaborate series of canals that ran between the structures. In the photo below the aqueduct is seen running up the hill towards the cliffs on the western side of the settlement. The next photo shows the upper section, near the edge of the cliffs. The aqueduct turned here to the left, up through the Qumran brook. 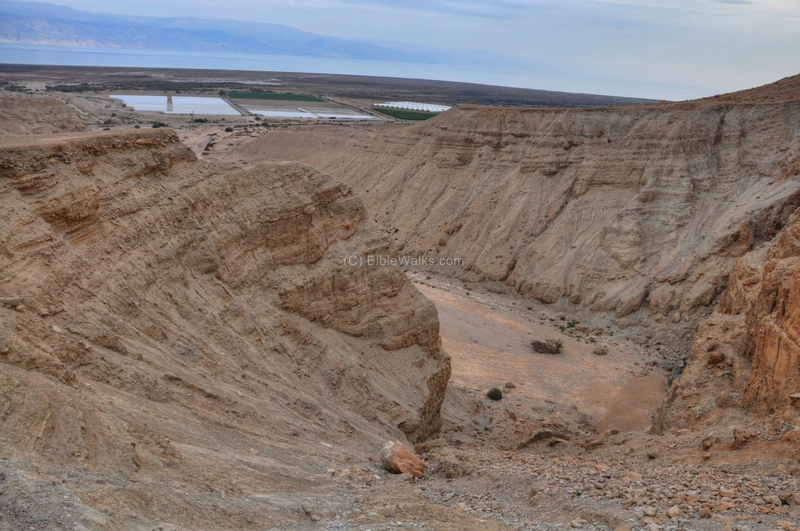 A view towards the east is next - with Qumran in the far center and the Dead Sea behind it. 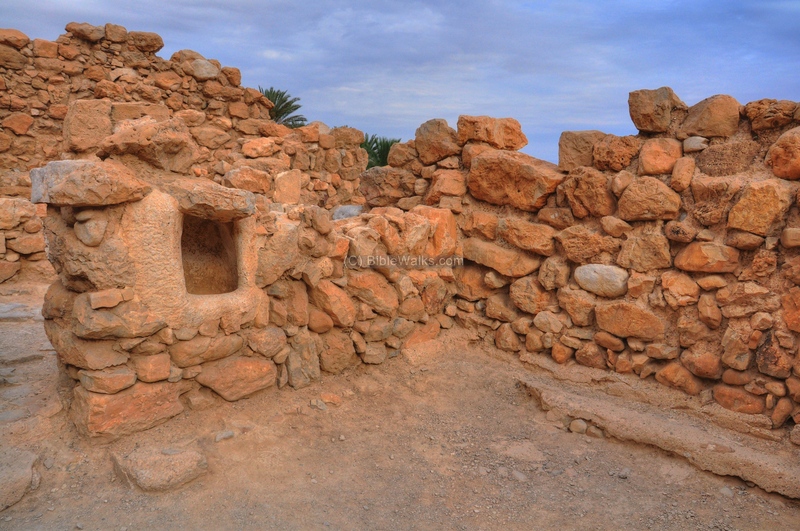 When the cisterns ran dry, the water was carried by animals from the wells of Ein Feshcha, 3.5KM to the south. The Qumran brook is located on the west side of the settlement, and passes south of it. It starts from the valley of Horkania, in the center of the Judean desert. 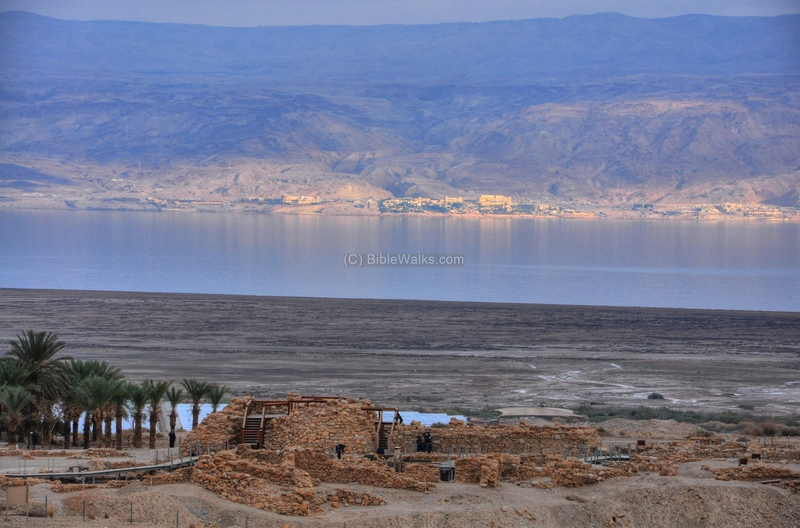 A view of the Dead sea is on the next picture. In the far side of the shore are the springs of Ein Feshcha. "For there are three philosophical sects among the Jews. The followers of the first of which are the Pharisees; of the second, the Sadducees; and the third sect, which pretends to a severer discipline, are called Essens. These last are Jews by birth, and seem to have a greater affection for one another than the other sects have. These Essens reject pleasures as an evil, but esteem continence, and the conquest over our passions, to be virtue. They neglect wedlock, but choose out other persons children, while they are pliable, and fit for learning, and esteem them to be of their kindred, and form them according to their own manners. They do not absolutely deny the fitness of marriage, and the succession of mankind thereby continued; but they guard against the lascivious behavior of women, and are persuaded that none of them preserve their fidelity to one man. These men are despisers of riches, and so very communicative as raises our admiration. Nor is there any one to be found among them who hath more than another; for it is a law among them, that those who come to them must let what they have be common to the whole order, - insomuch that among them all there is no appearance of poverty, or excess of riches, but every one's possessions are intermingled with every other's possessions; and so there is, as it were, one patrimony among all the brethren. They think that oil is a defilement; and if any one of them be anointed without his own approbation, it is wiped off his body; for they think to be sweaty is a good thing, as they do also to be clothed in white garments. They also have stewards appointed to take care of their common affairs, who every one of them have no separate business for any, but what is for the uses of them all..."
Qumran - Arabic name - meaning: grayish (as per PEF report). Kh. Kumran - Arabic: ruins of the grayish spot (being situated on a whitish marl) - the name of the ruins in the 1881-1883 PEF map. Essenes, Essences - Jewish sect during the 2nd temple period, started 145BC until 68AD. Unknown source of the Hebrew name (I'siim). 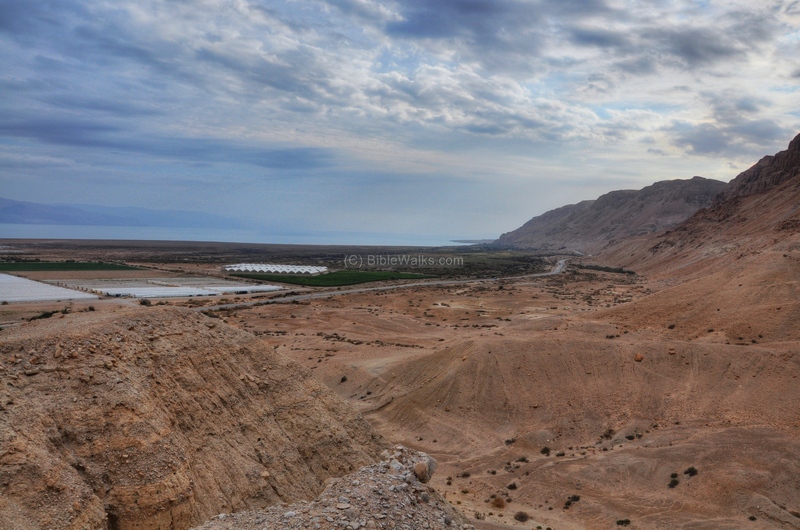 Settled along the west side of the Dead sea; one of their centers was in Ein Gedi.